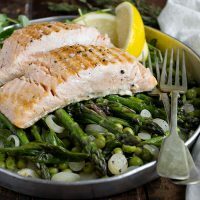 Butter Braised Peas, Leeks and Asparagus with Salmon is a delicious way to enjoy Spring asparagus. The asparagus is combined with peas and leeks and cooked in a butter, garlic and tarragon sauce. Late last week, I had the opportunity to visit an asparagus farm, to see how asparagus is grown, harvested and prepared for market. Did you know that Ontario grows most of Canada’s fresh asparagus? Fresh Ontario asparagus is also the first local vegetable of the year for those of us here in Ontario, so that makes it even more special. Over 90% of Ontario’s asparagus crop is a variety called Guelph Millennium, developed at the University of Guelph. It is adapted to colder climates and produces higher yields than other varieties. That means there’s always a plentiful crop of fresh and local asparagus available each Spring. I’m thankful for that! Even so, local Ontario asparagus is only available for a couple of months, so be sure to pick up and enjoy fresh Ontario asparagus now! Here are some photos from my day at the farm. You’ll have to look closely at the photo in the top left to spy the asparagus. Yes, asparagus fields are startlingly sparse! And if you snap an asparagus spear off in the field and eat it, it tastes surprisingly like peas. Before I left the farm, I had to pick up some (really) fresh asparagus from the market at Barrie Hill Farms. I also spotted some wild leeks (ramps), so I brought those home as well. 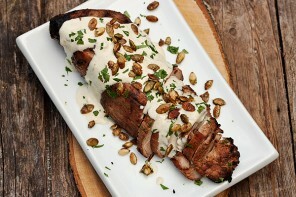 That was the inspiration for this dish. If you are not able to find wild leeks, regular leeks will work in this dish, as well. I didn’t include cooking instructions for the salmon. I grilled mine quickly on the BBQ. You could also use a grill pan on the stove-top or place in a baking pan and cook in a 400F. oven for 12-15 minutes. Obviously, you can just make the braised greens as a side or main dish for any meal or substitute any meat, poultry or seafood. If you don’t like tarragon, you can substitute dried thyme leaves. You can use regular or wild leeks in this dish. Instructions for both are included. If using regular leeks, prepare leeks by taking a 3-inch slice of the white part of the leek. Cut in half lengthwise, then slice into thin slices, to total about 1/3 cup. Rinse well and set aside. Roughly chop a bit of the top green from the leek and set aside. If using wild leeks, cut thin slices from the white bulb end to total 1/3 cup. Roughly chop the top leaves and set aside. Meanwhile, melt 1/4 up butter in a large frying pan over medium heat. Add white part of leeks and cook, stirring, until softened. Add garlic and cook another 30 seconds. Add asparagus and peas, tarragon and chicken stock. 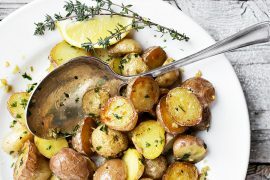 Reduce heat to low, cover pan (with lid or if your pan doesn't have a lid, place a baking sheet or piece of aluminum foil overtop) and simmer for 6-7 minutes. Remove lid. Add lemon juice and a splash of wine, if using. Scatter chopped leek leaves overtop and stir in. Season well with salt and pepper. Continue cooking until asparagus and peas are just tender and most of the liquid has evaporated. Meanwhile, cook salmon in a grill, in a grill pan on the stove-top or roast for 12-15 minutes in a 400F. oven. Remove to a serving dish. Top with grilled, roasted or pan-fried salmon. Asparagus and salmon are my perfect combo, Jennifer! 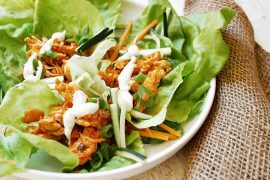 Loved the recipe and cannot wait to give it a try! 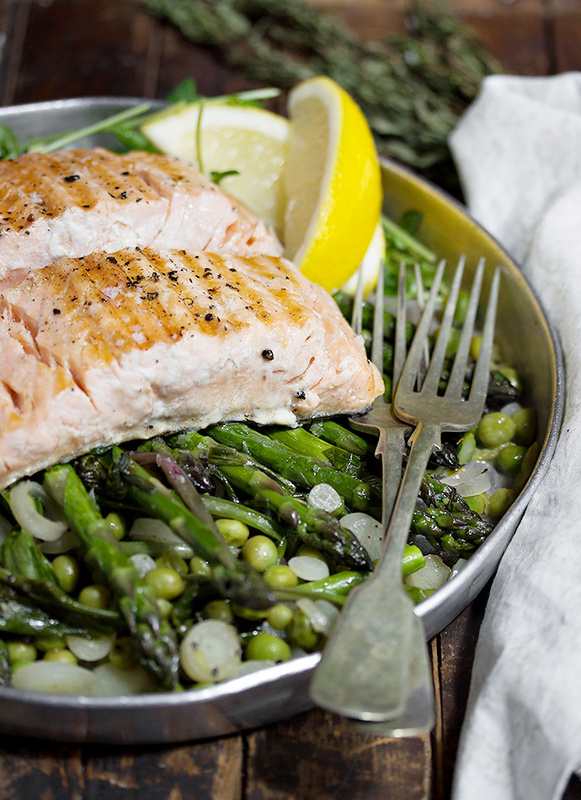 Such a gorgeous spring meal, the perfect way to showcase asparagus and salmon! Thanks Sarah. Definitely the variety of asparagus that they grow here prefers a colder climate (strain was developed here for our climate) and yes, Ontario’s climate is very similar to Michigan. That said, they did mention that California has almost gone out of growing asparagus, due to the water issues (I guess asparagus is a water-intensive crop). Apparently Washington state is starting to become a prominent producer now. You had me at butter braised, Jennifer! This dish looks absolutely PERFECT! 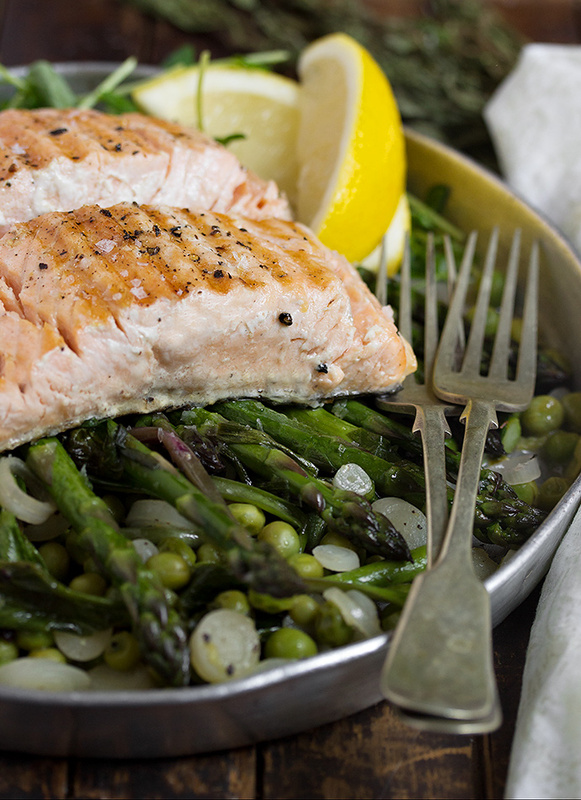 I love salmon with asparagus, but the addition of peas and leeks sounds amazing… plus the butter of course! ;) Such a fabulous spring/summer dinner! Cheers, friend! Wow my asparagus garden doesn’t look like this! 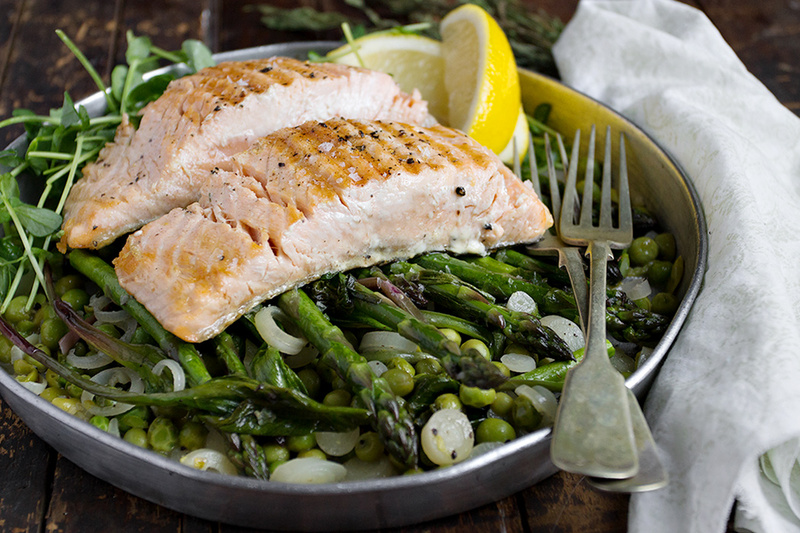 What a great way to use fresh asparagus and pairing it with salmon is always a favorite of mine. Love the photos from your adventure! Thanks Tricia. I think they cut away the foliage in the Spring on the farm. Easier to harvest, I guess. How fun to see how asparagus is grown! I visited a “white asparagus” farm in Germany. I kept looking for the asparagus but couldn’t see it – because it grows under the ground! Love this beautiful dinner. It has my name written all over it! Thanks so much, Chris. We learned about the white asparagus at the farm. I love salmon, it’s one of my favorites and it looks so delicious with all these fresh veggies! Thanks so much, Sara. We are salmon lovers here, as well! What a perfect meal Jennifer! Asparagus is one of my favorite veggies! Love it with the peas and leeks. Thanks Mary Ann. It’s a great combination. I loved the bit of tarragon with the veggies, too! That farm is incredible, I’d love to snap a stalk right from the field and eat it! This dish is my kind of food, so beautifully healthy, I wish asparagus were around all year :) Pinning and sharing! Thanks Sue! I never pass up a chance to go to see where our food is grown. It’s always so inspiring. Thank heavens for farmers!! A beautiful dish and I just love the combination of asparagus and leeks. The fields are quite a shock the first time you see them, aren’t they? lol It reminds me of the first time I went to Hawaii expecting to see pineapple trees and we drove for miles looking for them and suddenly realized that we had been passing by acres and acres of low lying shrubs with ummm….. pineapples! Not quite what I expected!